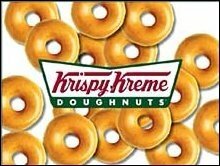 I adore Krispy Kreme doughnuts! Krispy Kreme is awesome! I hadn't heard of them till I moved to the south.. My school does fundraisers with them all the time. Mmmm ... where'd you get em? My sister's dying to try them. I'm jealous! I can only get Krispy Kremes once a month or so when my husband shops at this major Tesco in Slough (not our local store) where there's a Krispy Kreme shop. Must have more often.